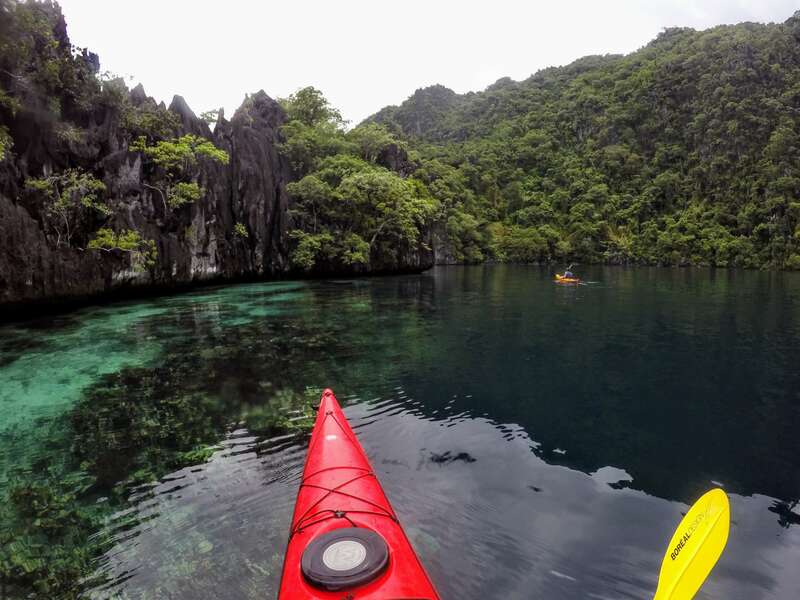 Escape the tourist trap and fall in love with the serenity, beauty and majesty of Coron Island the Tribal way–by skimming across glassy tropical waters in a true sea kayak. In so doing, you will glide in to the nooks and crannies of an environment that is in National Geographic’s Top Ten list of places to visit on the planet. 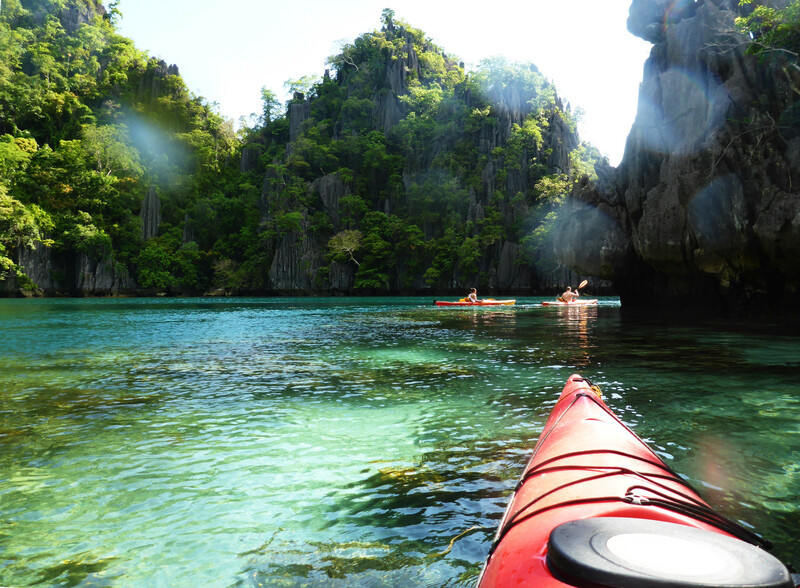 There’s no better way to experience Coron than by paddling, as the native Tagbanua, who own Coron Island, do. 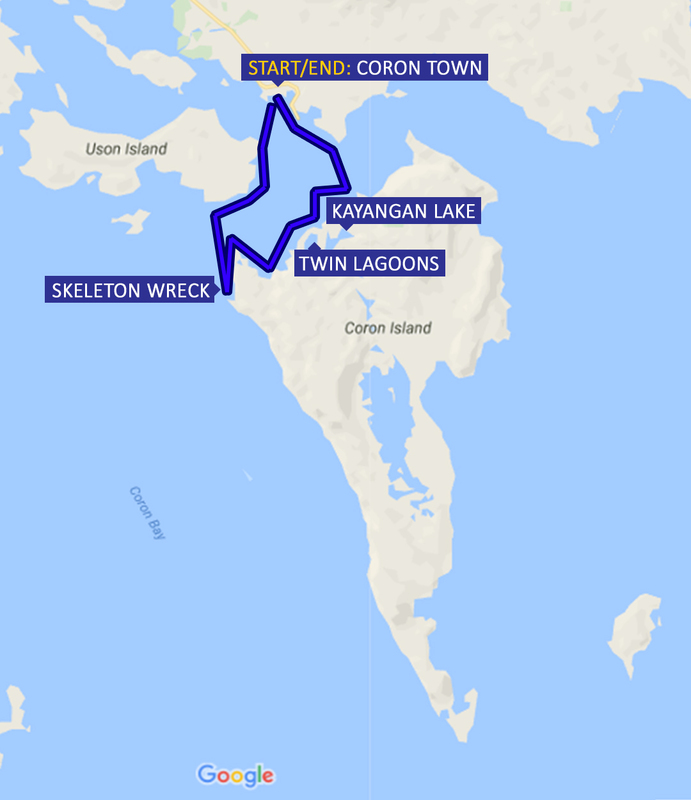 We paddle the 15 km circuit of the northwest coast with sit-in sea kayaks that can do the distance in a day with ease. Unless you tell us you are over 90 kgs and taller than 6 foot 2 inches you will be assigned our new Navigator fibre glass sea kayaks: These are short, nimble–so nimble they need no foot rudders. Should you be tall or large then you’ll be assigned a Perception Carolina. 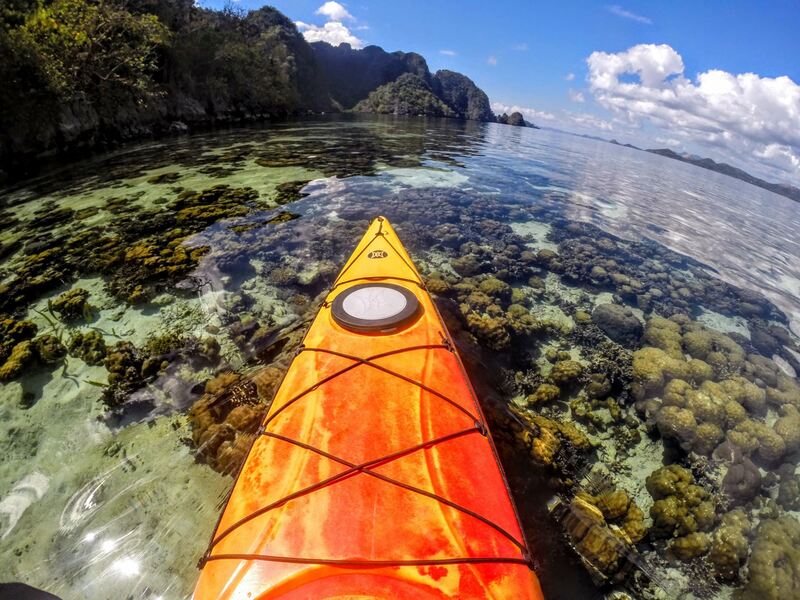 If you want to paddle a “divorce kayak” — a double — it will be subject to availability. If available, the choice is between a Wilderness Systems North Star or a sit-on double Navigator. 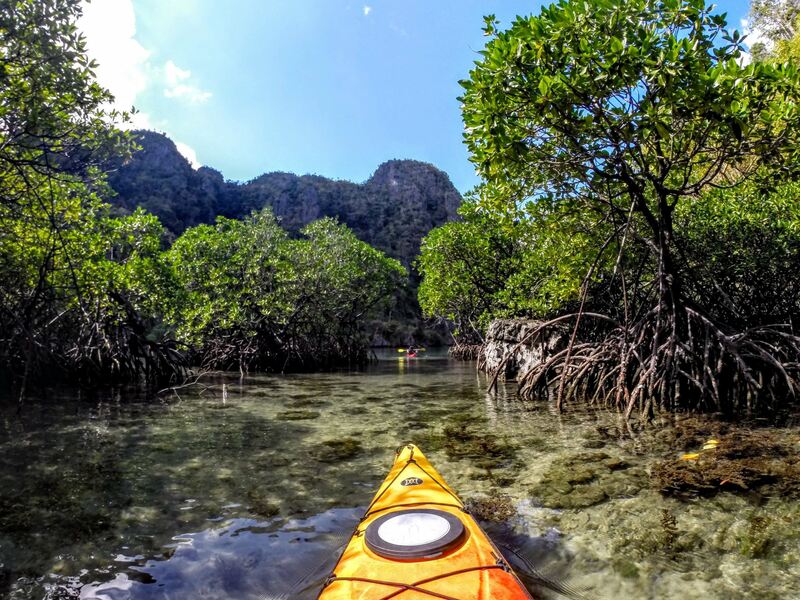 You will paddle through mangroves to Tagbanua Lagoon and on to Hear-a-Pin-Drop Lagoon which are accessible only by sea kayak. You will snorkel Kayangan or Barracuda lake. 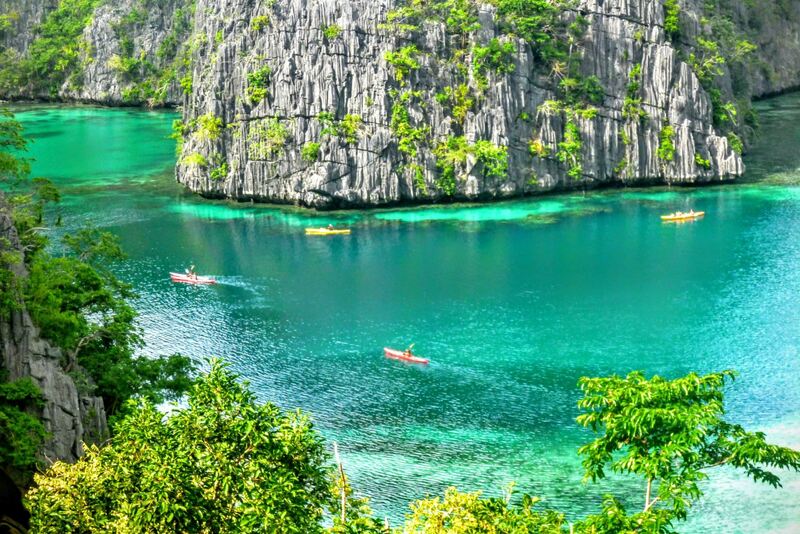 If Kayangan is not swamped with tourists it will be Kayangan and you’ll gaze down at the extraordinarily picturesque view of the lagoon below–arguably Philippine tourism’s most photographed natural scene. If it’s Barracuda, you will be plunging into a lake which is a thermal, meaning the water gets warmer the further down you free dive! The route your guide will take you depends upon the wind: Note the prevailing wind from June to October is from the west–the habagat as it is known. From November to May, it is from the east–the amihan. 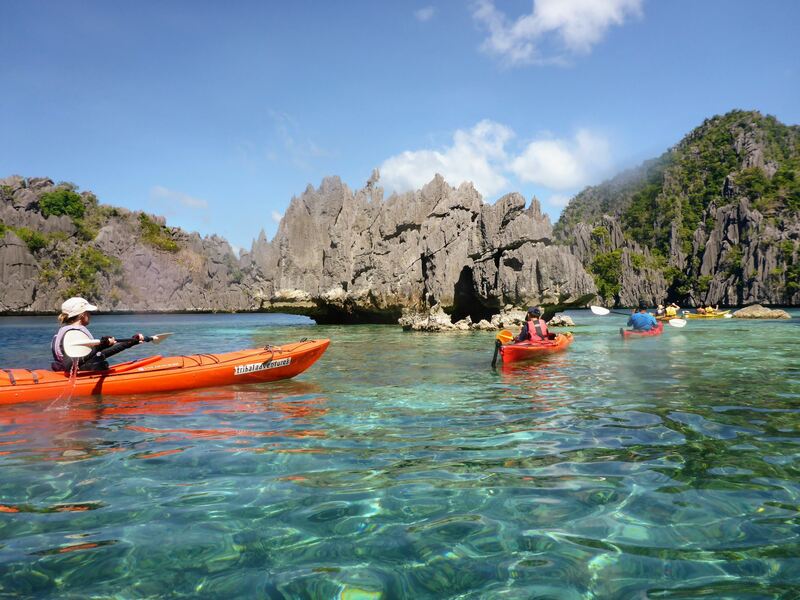 With habagat you might not get around Banol Point, so you will miss the beaches of Banol and Skeleton Wreck. 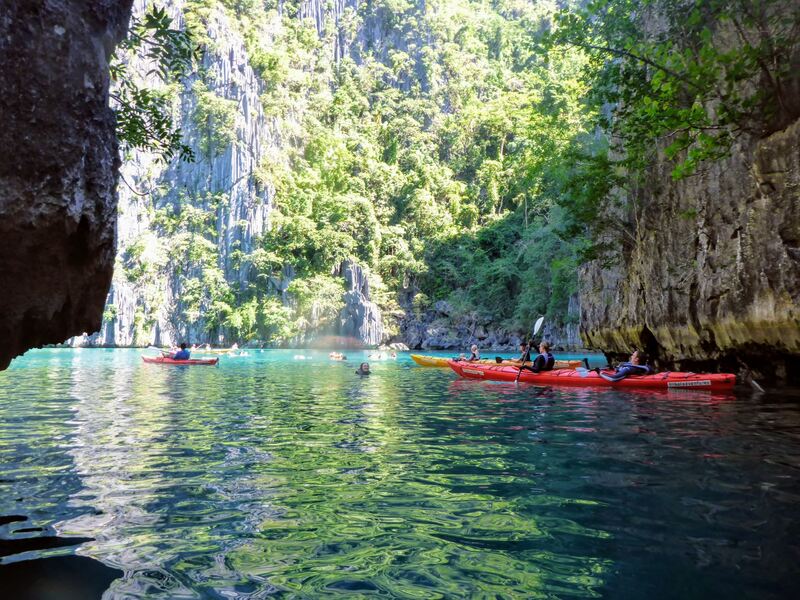 If your trip is during the amihan period, you might miss out on Siete Pecados and the bat cave. And do note, Tribal Adventures is not a group operator and will not be a slave to bucket lists: Most of our clients like us because we explore the less known destinations, escaping the tourist traps and providing a day of serenity away from crowds! If you’re in to following the mob and ticking off a bucket list as though it’s a grocery shopping list, we’re not for you. Paddle across to Jala-jala, skirting its mangrove forests, if conditions warrant crossing to Banol Point and its soft white sand beaches. 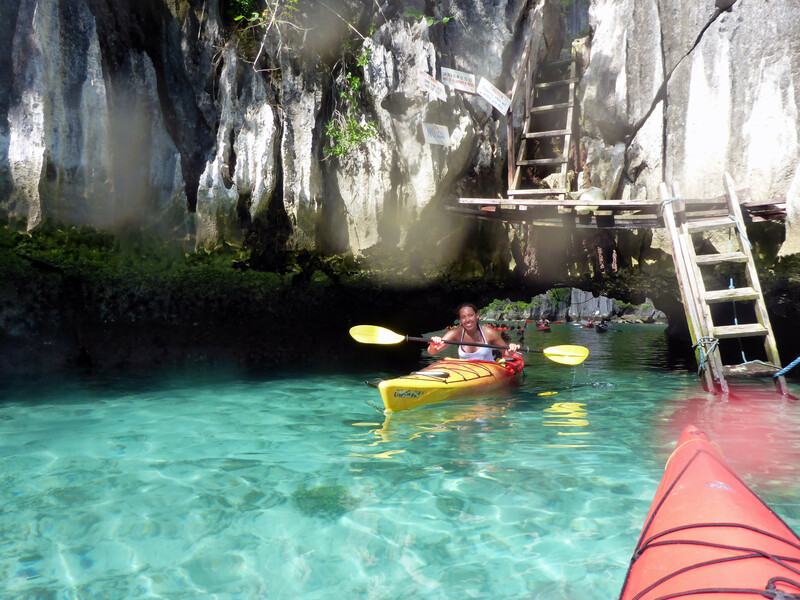 Drop paddle and snorkel the Skeleton Wreck, before having some merienda on a beach. 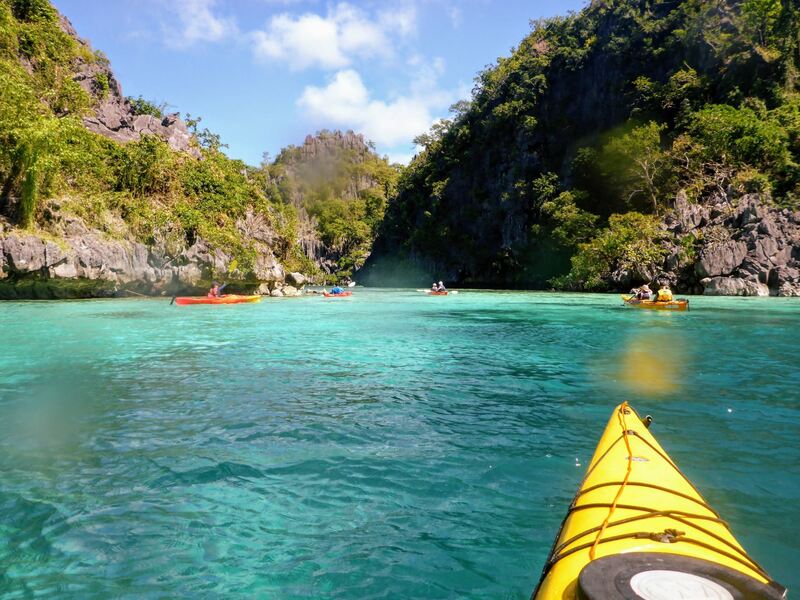 We retrace our path back around Banol Point and poke our kayaks into a cave and, if the tide is on our side, we duck and pass between the Twin Lagoons, getting in the azure waters for a snorkel and swim. 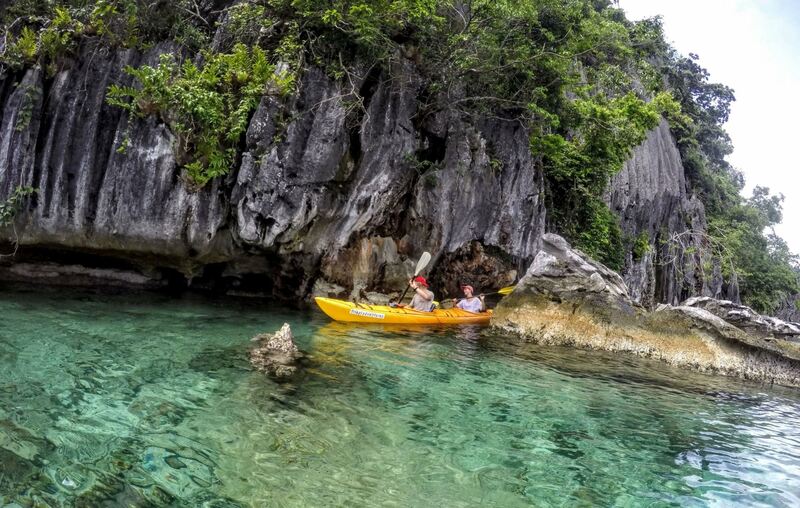 Hugging the rugged limestone coast we glide into numerous lagoons, passing by Barracuda Lake, a cousin of Kayangan Lake, our destination for lunch and an exquisite snorkel over cathedral-like rock formations. 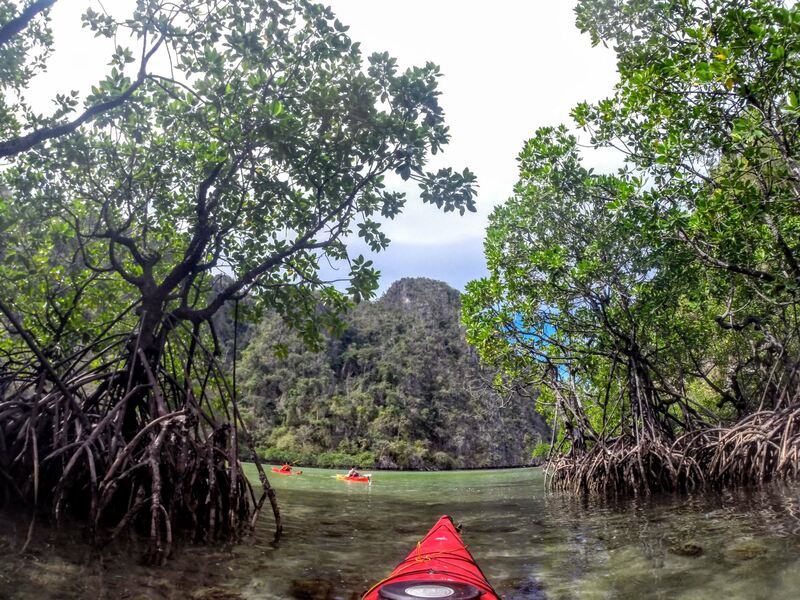 En route your guide takes you between innocuous rocks and mangrove trees to enter sheer nirvana for paddlers: Tagbanua and Hear-a-Pin-Drop lagoons. Late afternoon paddle back to town. (Or arrive be dropped off at your hotel if you opt for 4×4 pick-up from Cabu Beach).